During life, everyone meets a “Bob”. My Bob was a child of the depression; a GI, retired Postal worker and entrepreneur. He was able to make just about anything with his hands. Perched on pillars at the edge of his driveway, sat two eagles, mid-flight, that he had carved with his own two hands and cast in bronze. He built a kwanza hut for him and his wife to live in as he built his house. But before he built the house, he had to move the Boce ball court he had built for his wife. I first got to know him because of his handiwork. My sermon was forgettable (and I know because I had forgotten it), but I had mentioned new research on whether or not Noah’s Ark was a sewn boat based on an ancient boat excavated in the Sea of Galilee. Bob met me down stairs and asked for a picture of the boat. The following week he arrived at church, far to excited for a man who carries glycerin tablets for his heart, with two boards held together with twine based exactly off the archaeological diagrams. It would be three years and countless numbers of breakfast’s at the Grantville “Almost Home Café” when our next project would arise. I was planning a purity dinner for the middle school girls at the Church and I searched far and wide for a trinket for them to take home. 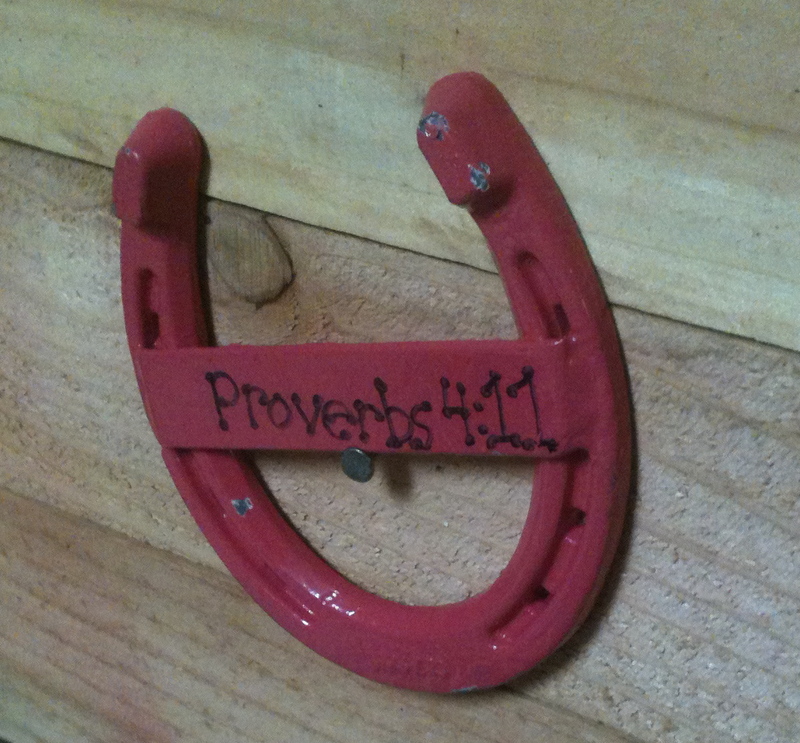 A friend showed me how simple it would be to weld a piece of steel to a horseshoe and write the Bible Verse on it. The problem however, was twofold: 1) I didn’t have access to a welder; 2) I had no idea how to weld. Bob was the answer to both. When he heard about my predicament, he told me to meet him at his house one afternoon. I met him as he was pulling out all of his equipment ready to go to work. He would spend the next 3 hours teaching me to weld, showing me how to set things up, and how to make a clean bead. After 40 horse shoes (80 welds), which for him must have seemed like eternity with my shaky hands in control, we had accomplished our goal. Just before I left his house he said this, “I feel guilty that I don’t help you out enough.” One of his attempts to help was buying me a mule to train, but that story is for another time. That was the beginning of Bob helping out at middle school youth group. An 80 year-old-man hanging out with between 50-75 inner city middle school students sounds like a social science experiment, but for some reason it worked. Bob showed up every week. He handed out snacks, talked with the kids, and helped me out. He didn’t understand a lot about them, questioned some things, but he was faithful and devoted to teaching the kids. Bob’s are a rare find today, just as they seemed to be back in Moses’ day. The placement of this verse is interesting. In verse 31-33, Bezalel is described as having both the theoretical ability (31), the material ability (32), and the physical ability (33) to make the structure and furnishings of the Tabernacle. On the other side, in verse 35, Moses reiterates the physical skills needed to make all the things of the Tabernacle. To link together, these thoughts, Moses shows how God has given them the ability to teach others to be master craftsmen and designers. The word the NIV translates “ability” in verse 34, is the hebrew word leb which is most commonly translated heart. So Bezalel and Ohilhab, didn’t just have the ability to do the tasks, but the heart to “teach” people how to do it. Elsewhere it ahs been discussed how the heart is more than just feelings and emotions in the ancient near eastern mindset. For Bezalel and Ohilhab, teaching [yare] or probably more accurate, showing or displaying for others, was a passion and desire. It was their will and motivation to help and teach others. I have known great and skilled people, who’s ministries, business, and legacies, did not outlive them, because they were unable to teach others. What makes Bezalel and Ohilhab, so special is not just their skill but their heart to teach. God set these men apart, because the job was bigger than just them. He knew that they needed to be leaders on display, teachers able to communicate, workers with dirt under their fingernails. Bob spent time investing in me. Bezalel and Ohilhab, spent time investing and training their people to the point where they became master craftsmen. There have been numerous men who have invested into me on all sorts of levels. It should be our heart, our will, our passion to do the same for the next group of men coming up in the Church. Whether it is going through a book with them, drinking some root beer and watching a game, showing them how to change the oil, or even just lunch after church, men take a moment to teach the next group of men. Church’s are full of young men needing spiritual mentoring and it needs to become our heart to teach others. Posted on March 8, 2015 by Travis GailPosted in Devotional, Man Talk, MinistryTagged Exodus, mentoring, Work.